“Anaheim has one main identity, as home to Disneyland. In order to muster a greater sense of civic identity, an urban design firm commissioned by the city to develop a master plan for the downtown area, much of which had been gradually torn down over time. Miss was asked to do a piece for a traffic circle that was part of this plan. This localized context represented the antithesis of Miss’s “off-the-pedestal” thinking; she proposed an alternative plan. She preferred to take the generic master plan and attempt to give it specificity by devising an “art master plan” that would be implemented by a variety of artists over time. Miss’s vision involved cultural anthropology and material culture, and she is as capable of uncovering latent subtexts. 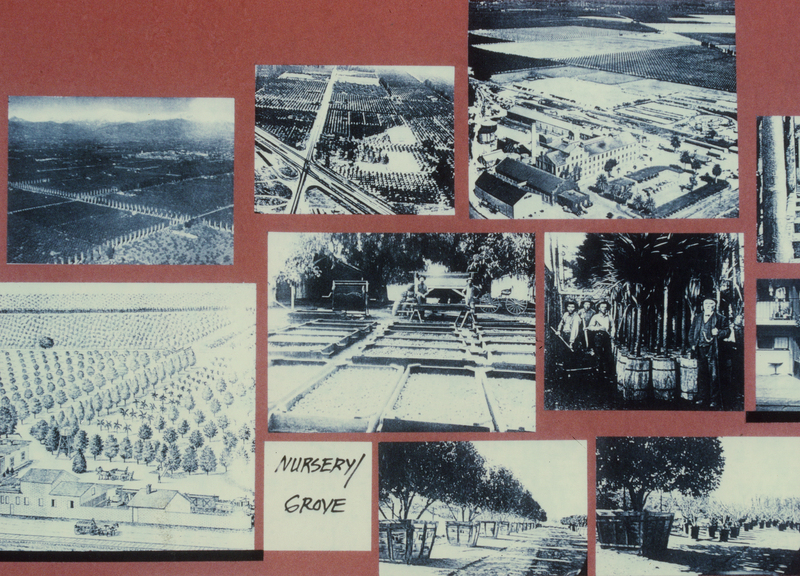 With her Nikon and sensible walking shoes, she visited Anaheim’s main avenues and side streets, where trellises and porches testify to the strength of the sun, and traces of irrigation canals evidenced the impact of water on the city’s agricultural history. Collectively, such artifacts add to the texture and character of the town. They also suggest an urban strategy that could be the basis of a dispersed layering: several types of interventions “planted” through Anaheim’s downtown area could, over time, bring character and unexpected reinterpretations of the found city. The proposal was not strictly architectural or “sculptural,” and not even a matter of urban design, but an incremental insertion in the public realm that simultaneously affirmed and changed its character through a series of built commentaries. Imported vegetation is ubiquitous in Southern California. In Anaheim, orchards had played a large role in its past and exotic plants characterize many front yards. Furthermore, there are many temporary nurseries nested among freeway underpasses in the area. As one of several possible alterations, Miss proposed filling in many of the empty spots in town, including the fringes of parking lots, with nurseries where the public could purchase plants, or where the city might park portable plants off season. She prescribed the construction of distinctive sun shelters that would become a recurring and important element in the area, “fragments of a spine,” and, because of the historic importance of water, she advocated modest collector fountains that would use gray water or roof runoff. Drinking fountains, designed by artists, could be another intervention spotted through the city. Artists might also be engaged to build on the Hollywood tradition in Southern California, to take the history of movie sets as a precedent for creating a wide range of pieces in unused pockets of space between buildings, for example, or in front of parking garages. Not surprisingly, she did consider/employ billboards or electronic media, even though the paradise of Pop culture, Disneyland, was minutes away. Miss was not manipulating received culture, making mass culture into something else a la Andy Warhol or Jeff Koons, but affirming the long-standing belief that artists can influence culture through an original initiative.